Field trips are an integral part of the CGP experience. 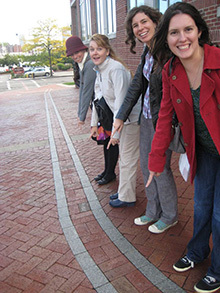 During their first three semesters, students take field trips to three major cities. Traditional destinations for these trips are Boston, Montreal, New York City, and Toronto. Each trip lasts about five days and includes a busy schedule of museum visits, behind-the-scenes tours, and discussions with museum professionals. Alumni events are also included, and give students the opportunity to network with CGP graduates in the field. Though busy, the schedule also leaves some room for free time. Students also take a number of regional day trips. Destinations have included the Corning Museum of Glass, the Museum at Bethel Woods, the New York State Bureau of Historic Sites, the New York State Museum, the Strong National Museum of Play, Fort Stanwix National Monument and the Arkell Museum. These trips reinforce and extend specific classroom topics, as well as adding to general museum knowledge. Finally, all the field trips provide students the opportunity to bond with their classmates in new settings. Members of the class of 2013 ponder over a map of Montreal during a field trip. 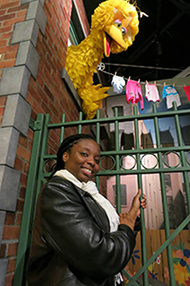 Ashley Bowden ('13) explores the Strong National Museum of Play during a class trip. 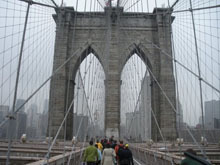 The Class of 2010 walks across the Brooklyn Bridge during their New York City field trip. The Class of 2013 spots the Freedom Trail while on a field trip in Boston.